Facebook has been testing a new messaging system out, where you pay the social network to send a message to a strangers’ inbox, rather than their ‘other’ folder. The catch is, the message will cost you to send. The company has been working on pricing issues for sending the message. 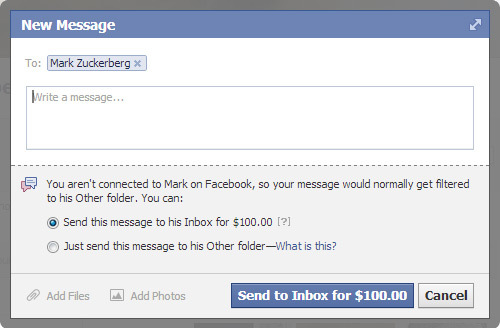 For some users, you can pay $1 to get the message sent, for others, it could cost $100. Facebook may work on a popularity based payment, for celebrities the message may cost $100 to send. Celebrities on Facebook may be the real deal breaker for this, for a crazed fan, $100 may mean nothing to get their message to the celebrity’s inbox. We suspect that when the celebrity finds out the fan has just splashed out $100 to get the message in the inbox, they will be more likely to respond. The odd first reaction was that Facebook groups and pages were going to be capable of inboxing you and Facebook would get paid every time this happened. For example, a user likes Starbucks, Starbucks then message the user with offers and discounts. This would be a pretty well thought out system, in truth. An advertiser is much more likely to send a message to a user that looks like they want offers rather than one user is to another user. Of course, some advertisers may go out their way to spam inboxes. We haven’t seen a pay-per-message-per-user setting in mail before, so that may rat out any spammers and keep top advertisers. Facebook may be cooking this up at a later date, we never know. For now, users will be able to message any random person for a payment, which may be based on popularity. With advertising starting to lose out due to AdBlock and other blocking apps and Facebook games not doing well, the social network may be looking for more ways to make money.